The 10th entry in Tinybop Inc.'s "Explorer’s Library" is now available, following earlier favorites from this developer including Human Body (#1), Plants (#2) and Skyscrapers (# 7). Kathleen Wilson reviews Coral Reef below. There’s nothing quite like the experience of being beneath the surface of the ocean, looking up to see the rays of the sun penetrating down from above, feeling the undulations of the underwater swells, quietly observing the sea life, and listening in awe to the muted sounds around you. Coral Reef (iOS, $2.99, Tinybop, Inc.; K-Gr 4) does a great job of capturing this essence. 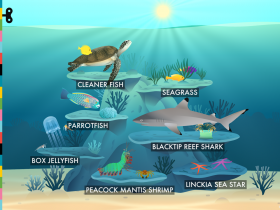 The app's strength is in the way it introduces children to the biodiversity and interconnectedness of an underwater ecosystem by allowing them to make choices, to set things in motion, and to watch, wait, and see what happens as the cycle of life unfolds. The main menu is a colorfully illustrated underwater scene with the sun visible just above the rippling surface of the water, its rays illuminating seven underwater plant and animal species arranged around a cluster of large, coral-covered rocks. Choosing any one of the seven species reveals a different scene to explore. 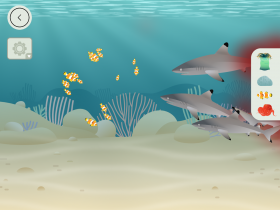 When, for example, the blacktip reef shark is selected, a new scene appears showing a shark swimming over the sandy ocean floor. Icons of a sea anemone, a rock, a clownfish, and a big blue octopus, representing the interactive options, can be tapped any number of times to be added to the scene. By selecting icons and waiting and watching, many activities will be detected. When a clownfish or an octopus is added, viewers observe the predatory nature of sharks. To protect themselves, the clownfish tend to nest in the sea anemones, which have tentacles that are poisonous to sharks. The octopuses can camouflage themselves against the rocks to make themselves invisible. When many octopuses are added more sharks will appear, a feeding frenzy will ensue, and red blood will cloud the water. The realities of the food chain beneath the ocean surface can be darkly dramatic! 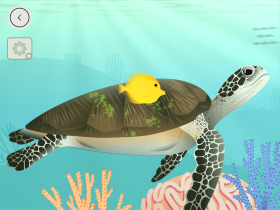 Other interactive scenes introduce children to concepts implied but not explicitly stated, such as photosynthesis (crank up the sun to allow sea grass to grow), symbiosis (help yellow tang fish eat the algae off the shell of a green sea turtle), and decomposition (feed zooplankton to a box jellyfish, then watch as it poops, bacteria arrive and the poop decomposes).